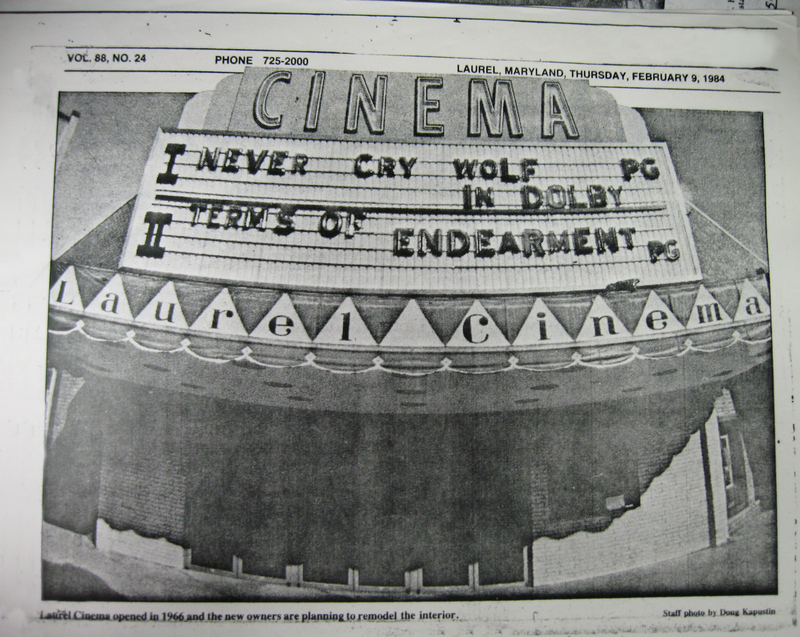 Growing up in Laurel throughout the 70s and 80s, there was never a shortage of places to catch the latest films. I lived at Steward Manor for most of this period, and while my parents and I did occasionally venture out to Greenbelt and New Carrollton, it was rare. Because right at home, technically within walking distance, were three theaters: Laurel Twin Cinema, tucked away in the northwest corner of Laurel Shopping Center; Laurel Town Center, at the corner of Rt. 197 and Contee Rd. 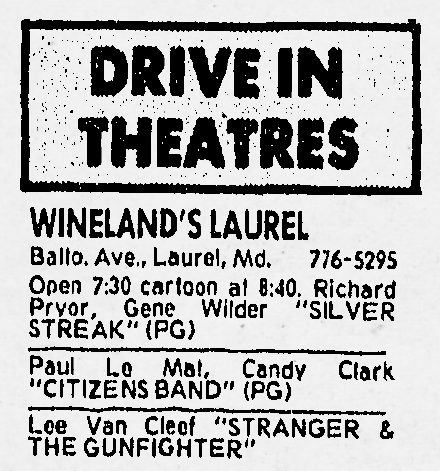 ; and arguably best of all, a drive-in—Wineland’s Laurel Drive-In on Rt. 1, directly across from the Shopping Center and mall. While the drive-in unfortunately shut down not long after I had the unique chance to watch E.T. 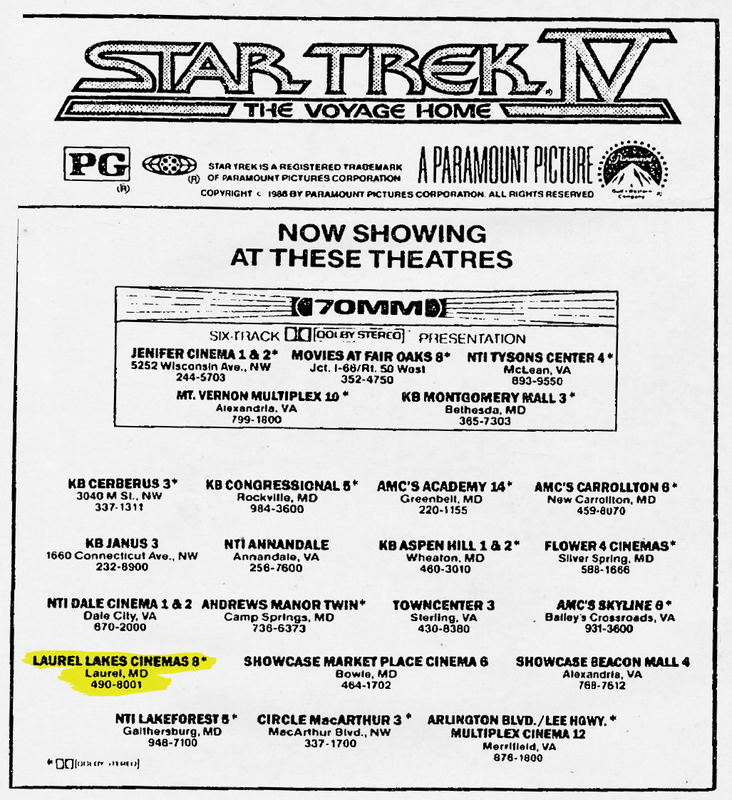 : The Extra-Terrestrial there (Wineland’s closed in October, 1984), Laurel made up for it the following year with the addition of its biggest theater yet, the brand new Laurel Lakes Cinemas 8—a venue that would eventually expand to 12 theaters (Hoyt’s Laurel Lakes 12). There were some changes over the years, particularly with Laurel Town Center. The 700-seat twin theaters (where I’m not the least bit ashamed to admit having watched Rocky III half a dozen times when it came out—it was that awesome) were acquired by Paul Sanchez—”a local moviehouse operator (who) made great gains in attracting crowds to his growing empire with a maverick 99-cent admission policy.” (Film Talk by Jeffrey Yorke; The Washington Post; Dec 19, 1986; WK37.) 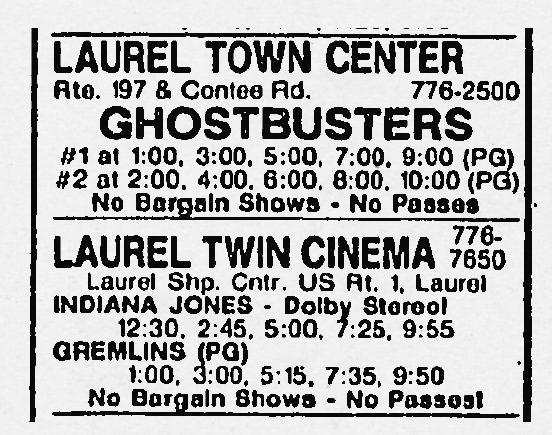 In the late 80s and early 90s, Laurel Town Center became known as the place to watch movies for 99 cents—the only catch being that the movies weren’t brand new releases, but rather, films that had been out for several weeks. But hey—99 cents! I’m also not ashamed to admit that I saw Roadhouse there at least twice during that period, but I digress. Yes, Laurel had the movie market pretty well covered, back in the day. But incredibly, not a single one of these movie houses survives as a functioning theater today. Ironically, the newest of them—the massive Hoyt’s Laurel Lakes 12—barely lasted 15 years. The entire Laurel Lakes Centre was bulldozed in favor of the Lowe’s Home Improvement Center that occupies the space today. I’m trying to contact various property managers to inquire about any possible photos of Laurel’s old theaters in their heyday; likewise, if you have any snapshots you’d be willing to scan and share, kindly let me know; or post them on the Lost Laurel Facebook page. In the meantime, here’s a quick look at some movie memories, Laurel-style. 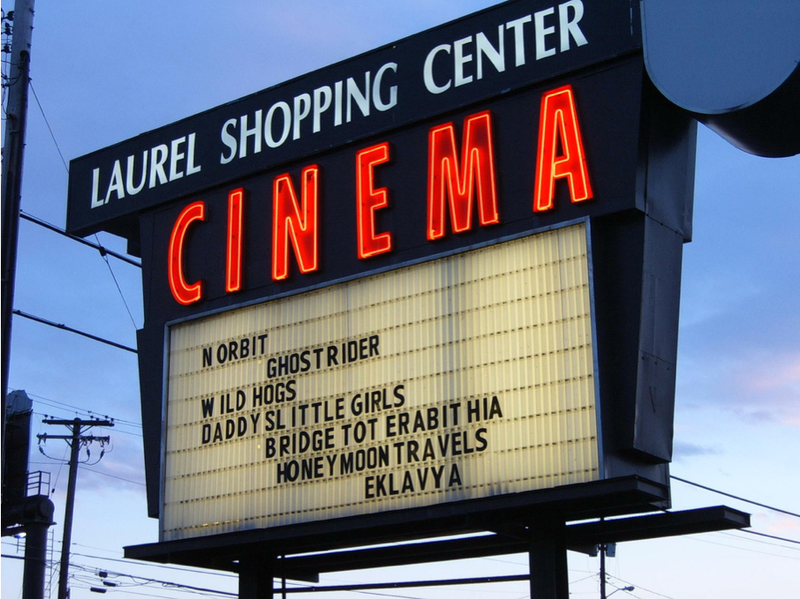 Despite the dysfunctional selections on the marquee, the 2007 photo above does a great job of capturing the essence of the iconic Laurel Twin Cinema sign. This was taken during a brief reopening, but the theater closed once again shortly thereafter. The marquee, which still stands at the entrance to the Shopping Center, has lost its “CINEMA” neon, and the rusting hulk is likely on borrowed time. When I stopped by and snapped the photo below just before Christmas 2011, it was advertising the new L.A. Fitness center (albeit in a rather dyslexic manner) currently being built in the former Hecht Co. building nearby. 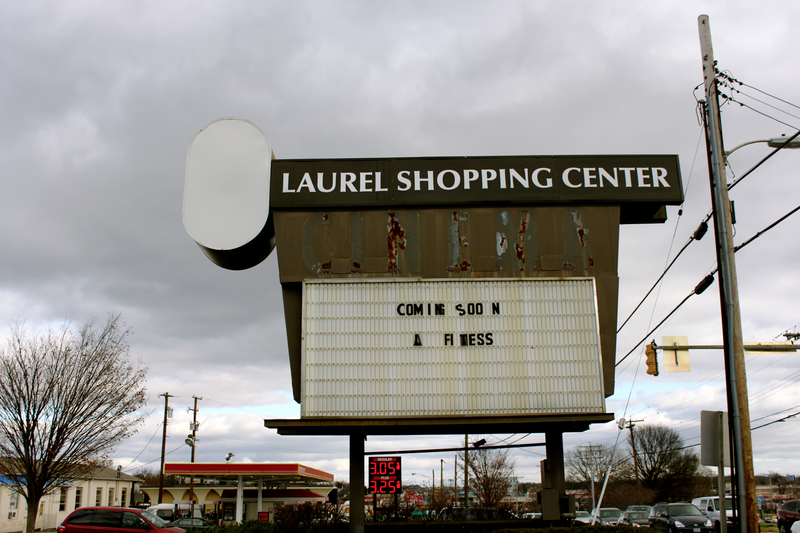 Especially at night, this sign was typically the first and last thing you’d see when passing by Laurel Shopping Center. For some reason, I’ll always picture it with The Breakfast Club on the marquee… probably because that’s where I first saw it, and I’ve loved it ever since. 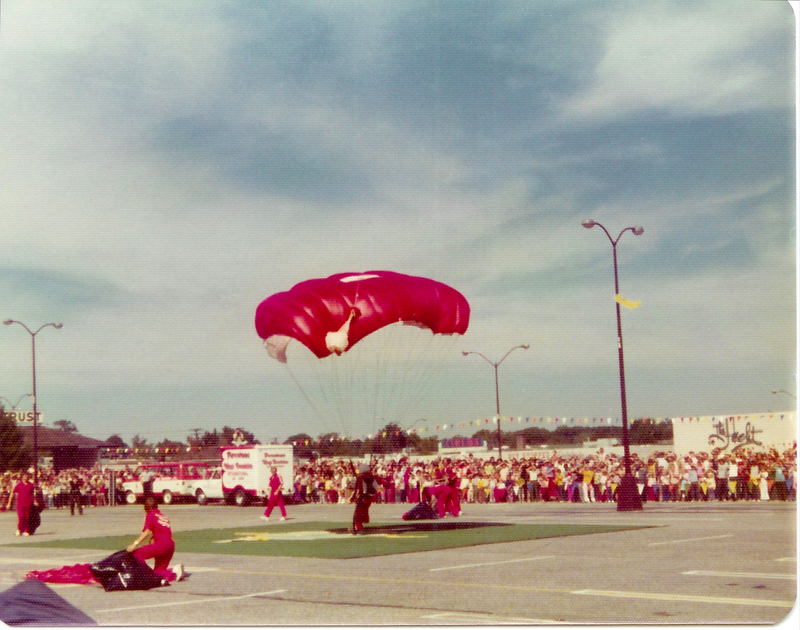 If you click on the fascinating photo below from 1975 (and look beyond the spectacle of the parachutist landing not far from where Gov. George Wallace was shot just three years earlier) you’ll get a glimpse of the theater itself off in the distance. If I had to guess, I’d bet that Dog Day Afternoon and The Apple Dumpling Gang were playing at the time. Laurel was always pretty good about ensuring film fare for both adults and kids. The photo below shows the empty drive-in grounds in October 1984, shortly after it closed down. As some have remembered, there was indeed a small playground directly below the screen—you can see it in this stunning shot. I actually only went to the drive-in for that one movie; probably because it was a double-feature, and my parents were wary of ever getting stuck in the car for that long again. 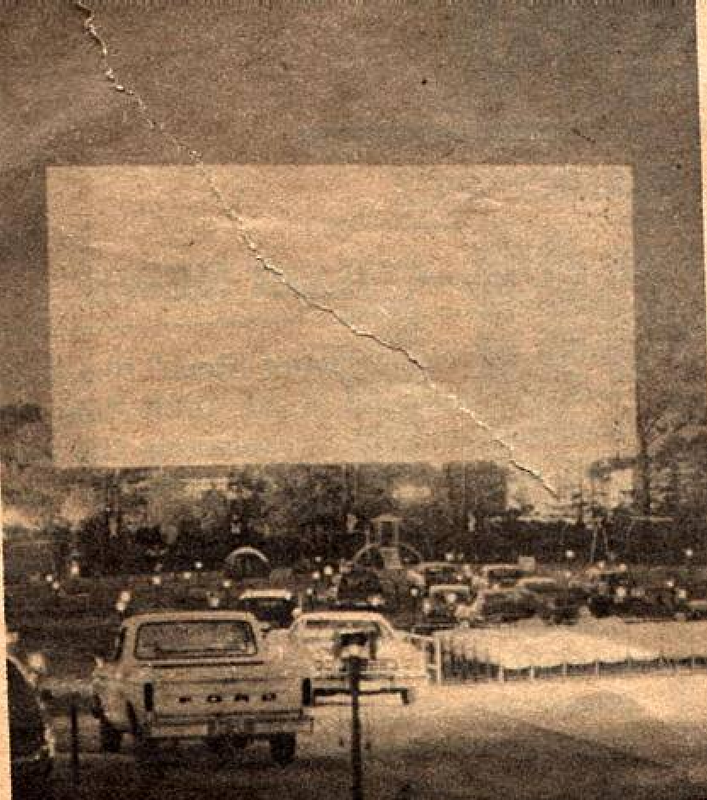 Strangely enough, however, I have an equally strong memory of the back of the drive-in screen. 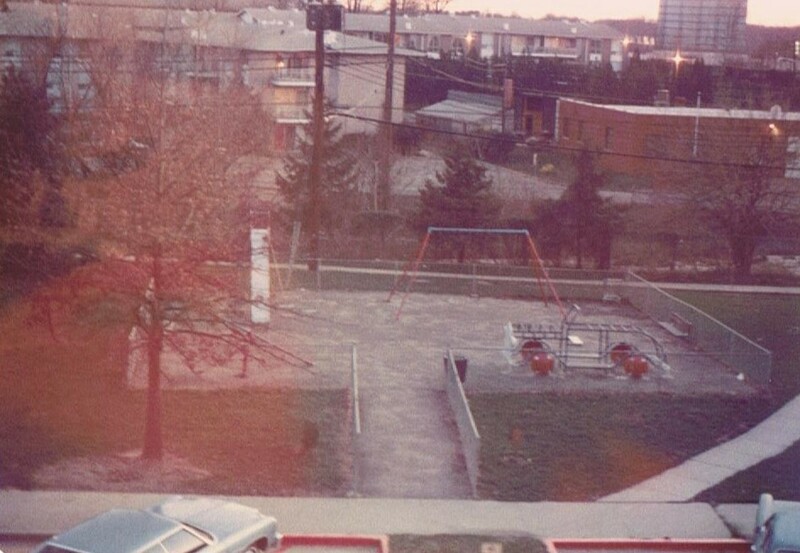 It was a common vantage point from my Steward Manor neighborhood, as my friend Jeanette’s photo from her apartment in the early 80s clearly reflects. Others have fondly recalled watching movies (sans sound) from the vantage points of the Laurel Centre Mall upper-level parking garage, Burger King, and Pappy’s, all of which provided an unimpeded view of whatever happened to be playing that particular night. Below is an aerial comparison (which I highly recommend exploring for yourself at historicaerials.com) showing the drive-in complex as it appeared in 1980, and in 2006 (which is essentially how it remains today). 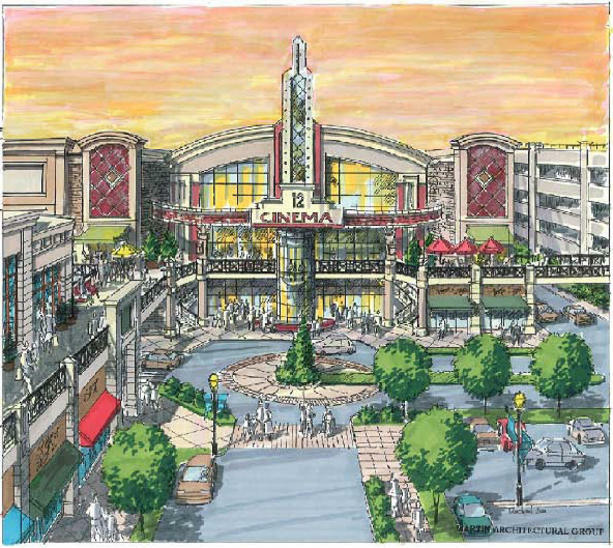 It’s safe to say that I might never have the chance to watch another movie in Laurel, even if the plans for this new Laurel Town Centre (or whatever they’re ultimately calling the new shopping center that’s scheduled to replace the old Laurel Mall) do include the state-of-the-art theater that’s promised. Regardless, I’ll always associate memorable films with Laurel. My very first movie date was at Laurel Lakes Cinemas. The last movie I saw in Laurel was there, as well—Twister, in 1996, with my future wife. I remember the Towne Centre Twin theaters well, I saw the Muppet Movie there in 1979 and as well as many others. When I got older, my friends and I would walk up there, since I lived on Montpelier Drive. I remember all of us going to see Splash, during Spring break, 1984. 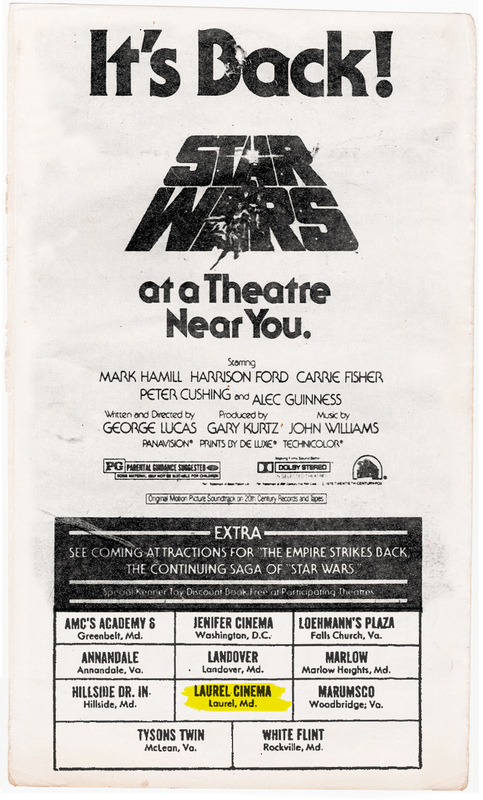 I loved the theater…as well as the drive in. It’s a shame it closed, it was a true piece of Laurel!! Great page. 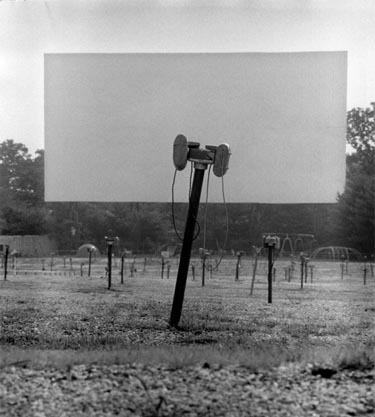 I’m actually responsible for the torn B&W photo of the Laurel Drive-In above, having contributed it to another drive-in site years ago. Glad to see it making the rounds. 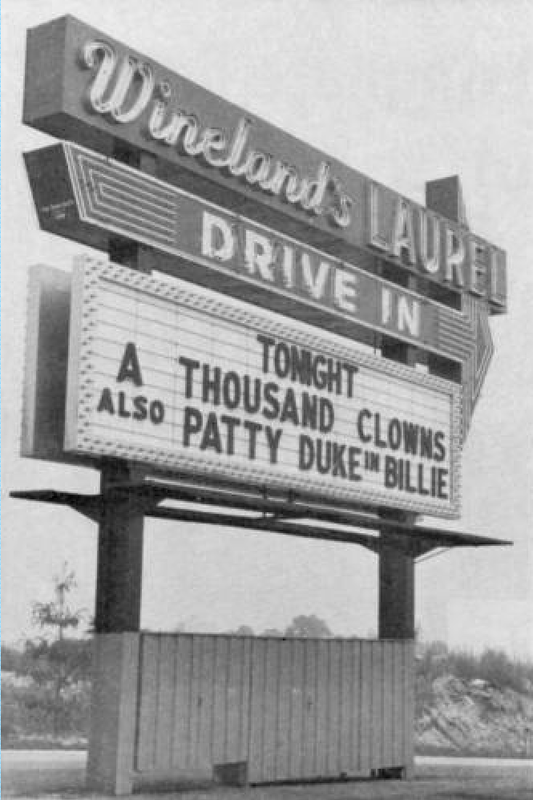 I was lucky enough, as a child in the early ’70s, to attend the Laurel Drive-In a few times. Our last visit was in June of 1975 for a Disney double-feature of “Bambi” and “Superdad”. I remember seeing the trailer for Disney’s next release due out that summer, “One of Our Dinosaurs Is Missing”, between the pre-show cartoon and the evening’s first feature (Bambi). With its sprawling playground, illuminated speaker posts, 250-seat outdoor patio and McDonald’s-esque concession building, the Laurel was by far the sleekest of the four Wineland-owned ozoners (ABC, Hillside and Super Chief being the other three). The last time I ever saw the Laurel was in the Fall of 1976 during the day. “Car Wash” headlined the marquee. My first time ever visiting a drive-in theater was in 1983 at the Wineland. My family and I saw “The Dark Crystal” there (sparking a bit of an addiction-that was my favorite movie until my early teen years when “Ghostbusters” took over top billing in my mind), and it’s sad to think that the next summer was the last year the place was open. The Laurel Town Center theater was a bigger draw for us-I remember seeing “The Muppet Movie” there as a young child, and my friends and I loved going there to see movies when I was a teenager-for some reason (maybe because I was FINALLY old enough to hang with my friends on my own without grownups chaperoning us? ), I especially remember seeing “Top Gun” there! Man, I didn’t even know that the Laurel Lakes Centre was bulldozed years ago! That used to be the other place my family and I went to shop and check out movies during my teen years-to think that yet another part of my youth was sacrificed in the name of Big Box and I didn’t even know it all this time! Laurel Lakes, Wineland Drive-In, Laurel Town Center-all treasured parts of my youth, now all gone. That is depressing indeed. Thanks for a very enjoyable trip down memory lane and history of movie theaters in Laurel. We moved to Laurel (from Oregon) in 1974 when I was 11 years old. I have many wonderful memories of growing up there and viewed many movies, at all of the movie theaters listed, over the years. I still fondly remember our parents taking my brother and I to watch all of the Planet of the Apes movies one night at the drive-in theater, my first drive-in movie date, sitting outside the projection booth listening to the bugs getting zapped, sneaking friends into the movies (via the trunk), meeting girls, etc. Moved away in 1993 and return to visit family a couple times each year, and am saddened by the deterioration or disappearance of so many places where I experienced wonderful childhood memories while growing up (i.e., Laurel Mall, Wineland’s Drive-In theater, Town Center, etc.). Well, at least Tippy’s is still open (called Toucan Taco for at least 10 years now) and I can still enjoy some Queso & chips!! !